Founded in 2009 the Tenerife's premier diving and snorkeling centre has a fantastic location in the Puerto Colon harbor - main tourist marina in Las Americas, south of Tenerife. 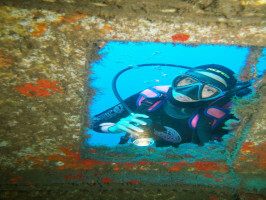 There are a lot of wonderful dive sites in the south of the islands. The places visit are home to a variety of animals such a different types of rays, moray eels, turtles, colorful fish, trumpetfish and sometimes angel sharks. In this volcanic island, you can also swim in the peculiar rock formations like tunnels, chimneys, caves, holes… and discover a totally surprising world. Daily departures (Monday to Saturday) at 9am from Puerto Colon for certified divers. - All dives are guided. 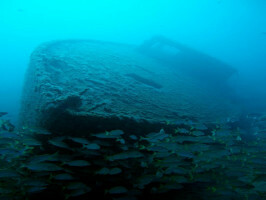 - More than 15 different dive sites available including Deep, Wreck, Drift or Cave dives. 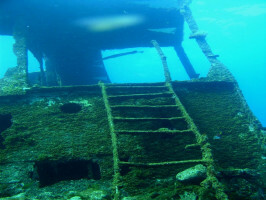 - Selection of the site depends on weather conditions and the level and experience of divers. - Duration: 1 tank dive, max 50 min. - Equipment included in the price. - Insurance is obligatory and is excluded from the price but it is possible to purchase at the dive centre. - Minimum age: 10 years old. - N.B If the diver has less than 10 dives or more than 6 months since their last dive or is certified as a Scuba Diver, the diver must first do a (refresh) dive with beginners in a shallower bay. The diver will do a full 1 tank -dive as a certified diver and have the opportunity to get comfortable in the water in easy diving conditions. All succeeding dives can be conducted with certified divers in the morning. All participants must have a valid diving license. Please bring swimsuit, towel and biodegradable sunscreen. - Meeting point: Puerto Colón ,Costa Adeje office nº125.